Huzzah! The new issue of Imbibe is here! The cover story? “The Summer of Tiki.” Also featured are articles about American soda fountains, cyclists guzzling beer, Spanish wines, and the drinking scene in Austin, Texas. Get yourself a copy, and check the link above for more Tiki-fied Tipples. Shake well with ice and pour, unstrained, into a Collins glass. Fill with additional ice if needed. Garnish with a skewered orange slice and a piece of candied ginger. If you like, dust the garnish with 5-spice powder. *Five-0 Syrup: 1 cup honey, 1 cup water, 1 tablespoon 5-spice powder. Combine over heat and bottle, straining through three layers of cheesecloth or a coffee filter. Keeps 2 weeks when refrigerated. Very good! The Bum came up with this one in celebration of the Tiki-Ti’s 50-year Anniversary, no small feat considering the number of Tiki bars that bit the dust since their creation in the 1930s. It’s basically a modification of the Tiki-Ti Punch, which itself is a modified Ti Punch.The Mount Gay doesn’t get in the way of the other flavors in this one; the orange dominates the citrus, though the lime provides just enough zing without turning the drink tart. The ginger is barely detectable, but there. I suggest dipping the garnish into the drink and holding back on the 5-spice dusting, as it easily takes over the drink. Shake well with ice and strain into a chilled cocktail glass. Drop a stemless cherry into the drink, and drizzle a little grenadine (1/4 ounce) into the bottom of the glass. Do not stir after garnishing! 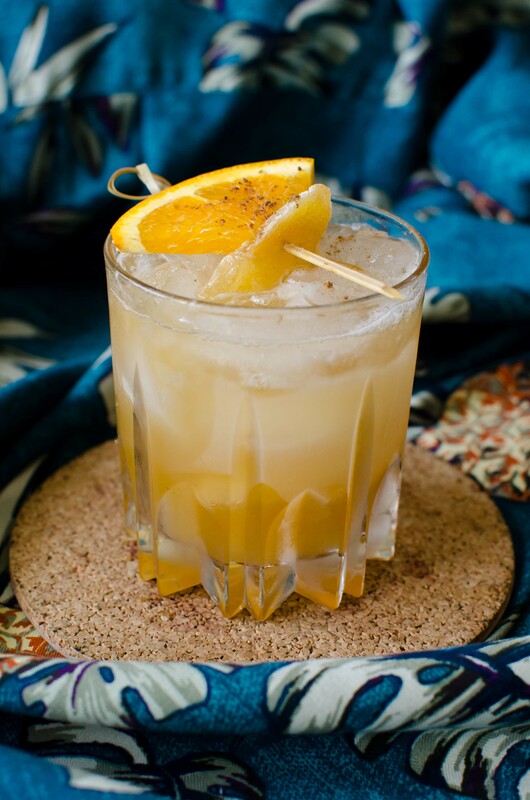 This one comes from the pages of Vintage Spirits & Forgotten Cocktails by Ted Haigh, and was named for the (spectacularly bad) 1927 Rogers & Hammerstein operetta-and-film of the same name. The drink, however, was named “World’s Finest Cocktail” by the UK Bartender’s Guild in 1930, and deservedly so. Well-balanced with a host of flavors I absolutely love (the Calvados in particular), I’ll list this drink as one of my favorites. The Golden Dawn is slightly on the sweet side, so consider yourself forewarned. As Paul Clarke notes, Dr. Cocktail apparently revised his recipe and omitted the triple sec in this version, which was a good call. In my haste to mix the drink (silly me) I forgot the cherry; no matter, my homemade ones are nearing the end of their shelf-life, anyway. The Doctor provides an alternate mixing ratio, and for those of you who are curious, it is 2:2:1:1, respectively, for the ingredients listed above. Dr. Haigh says the Twentieth Century cocktail tastes like Art Deco. 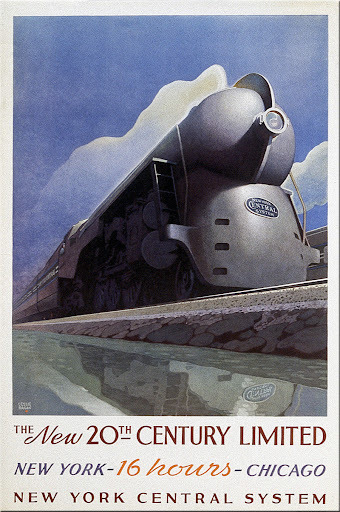 I think the Golden Dawn should be its companion-in-taste, the geometricized rays of the golden sun rising over New York in the East, guiding the 20th Century Limited’s path to Chicago in the West. Thanks to the Bum! I also recommend Old Sugar Distillery’s Cane & Abe Rum for the Tiki-Ti Five-0. Very delicious. The Bitter Mai Tai mentioned in the same article is also excellent. 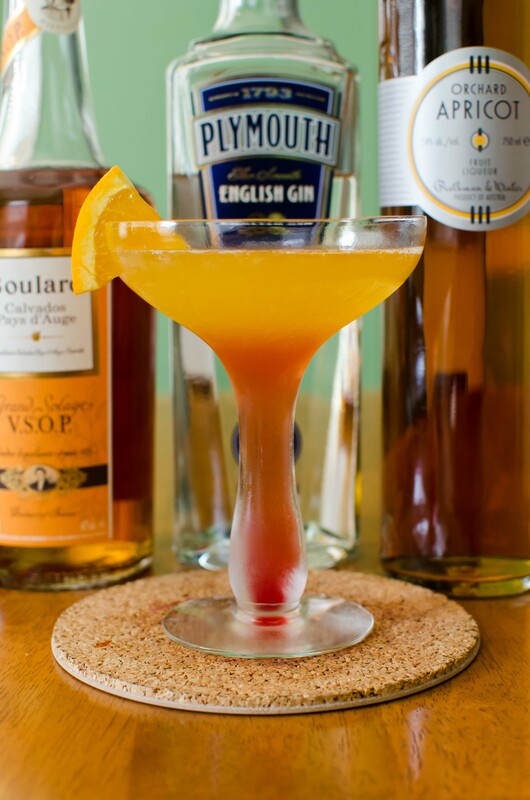 This entry was posted on July 3, 2011 by IJ Lauer in Apricot Brandy, Calvados, Domaine de Canton Ginger, Drink Recipe, Gin, Rum, Tiki and tagged apricot brandy, beachbum berry, calvados, cocktail, gin, ginger liqueur, golden dawn, recipe, tiki drink, tiki-ti five-0.